Now, E! 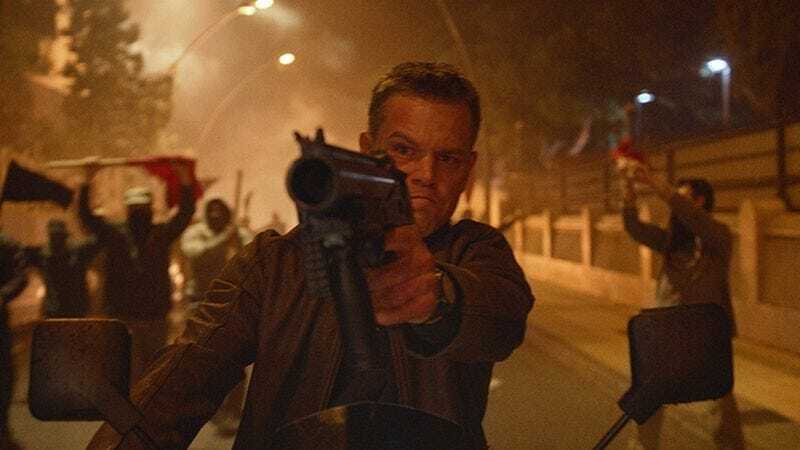 News has asked Jason Bourne stars Matt Damon and Julia Stiles about the “tear guns off of posters” movement, and though they don’t exactly support it, they’re not as opposed to the idea as you might think. Damon says he “totally” gets it and “doesn’t blame [Lena Dunham] at all,” adding that he understands why people might not want to see pictures of guns right now, but he doesn’t think the imagery is “gratuitous.” After all, as he points out, Jason Bourne is “a guy who runs around with a gun,” so showing him with a gun is simply a reflection of what the movie is about. That kind of reads like he’s saying “deal with it,” but Stiles’ response is a little more thoughtful. She explains that the Bourne movies usually revolve around Damon’s character “struggling with his own conscience” over the fact that he has to kill people, noting that he “regrets having to kill people for what he thought was a good cause.” So, while the poster may show Damon’s Bourne holding a gun, the movie itself “is not one that glorifies or makes heroic the idea of being violent.” As a matter of fact, Stiles argues that it “promotes the idea of questioning violence and questioning your government.” That’s a little harder to fit on a poster, though.